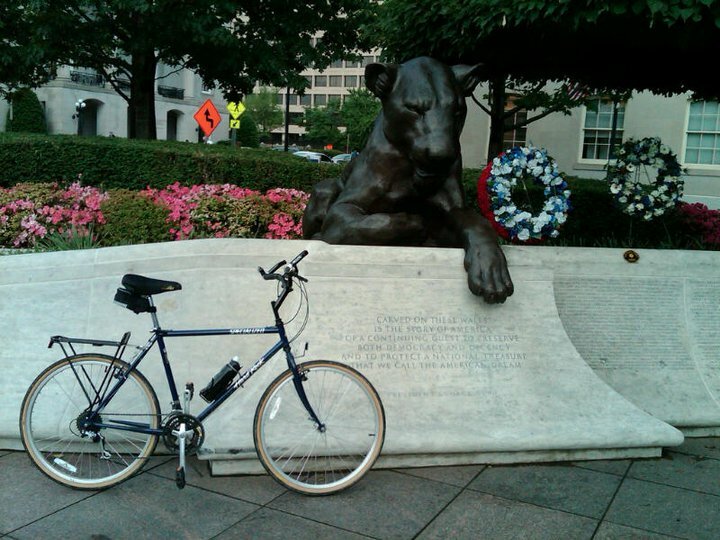 This week is National Police Week, and during this lunchtime bike ride I stopped by the National Law Enforcement Officers Memorial. 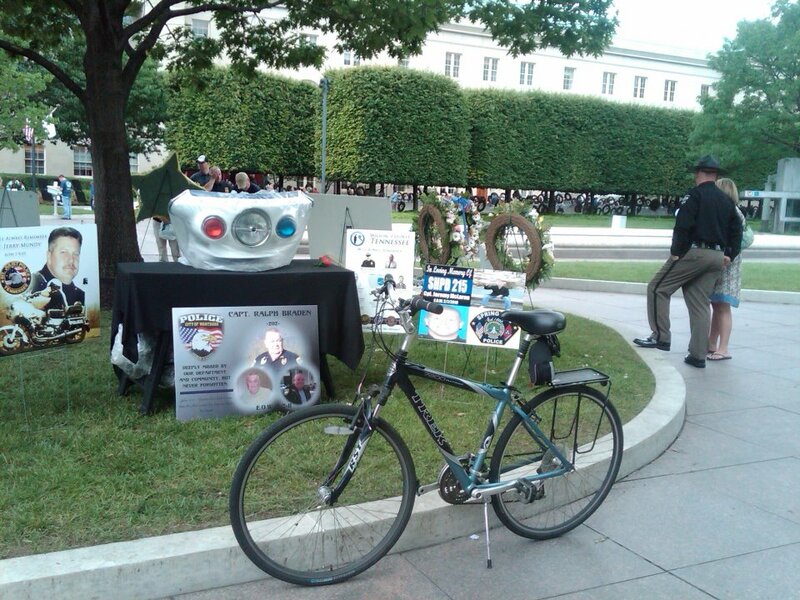 I stop by every year during National Police Week because it is one of the most personal and deeply meaningful aspects of the week. 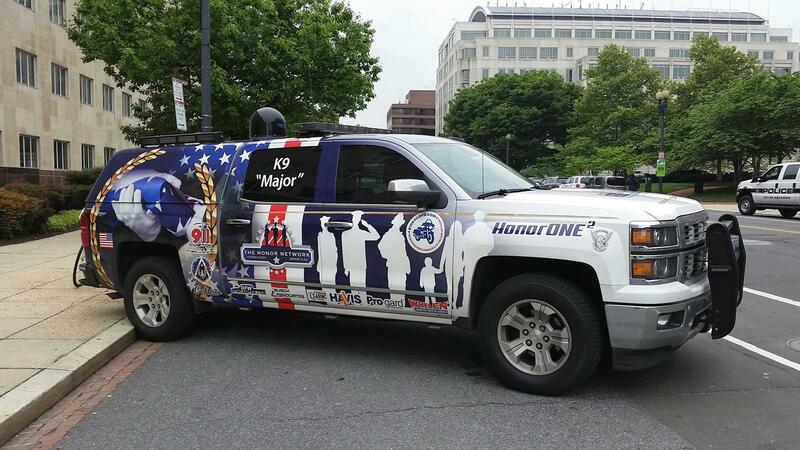 The things you see here in D.C. during the week can be entertaining, like the various vehicles. 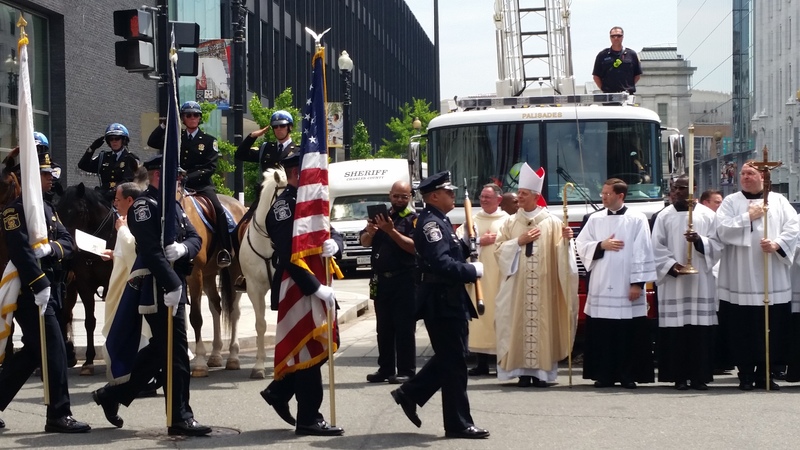 And the Blue Mass at St. Patrick’s Catholic Church, to include the procession that precedes it, as well as the Peace Officers Memorial Service like the one yesterday, are all quite moving. 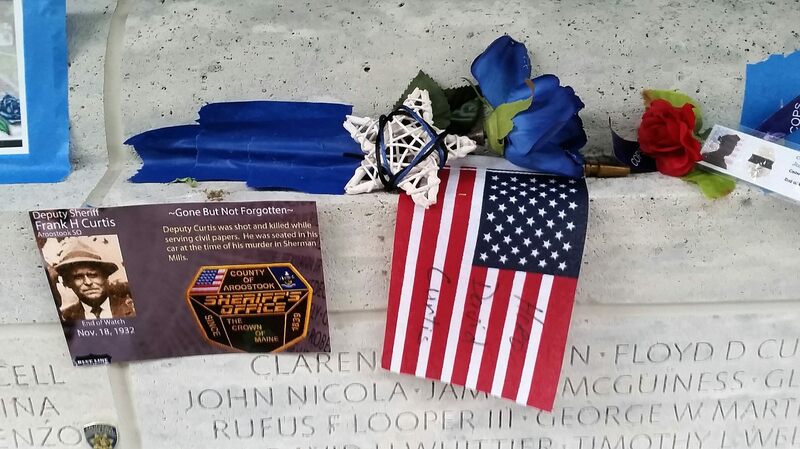 But to better understand the sacrifices made by the officers being honored and remembered, and the loss and the pain of the family members, friends and fellow officers they left behind, looking through the tributes left on or near the walls of the National Law Enforcement Officers Memorial is one of the most meaningful ways to do it. 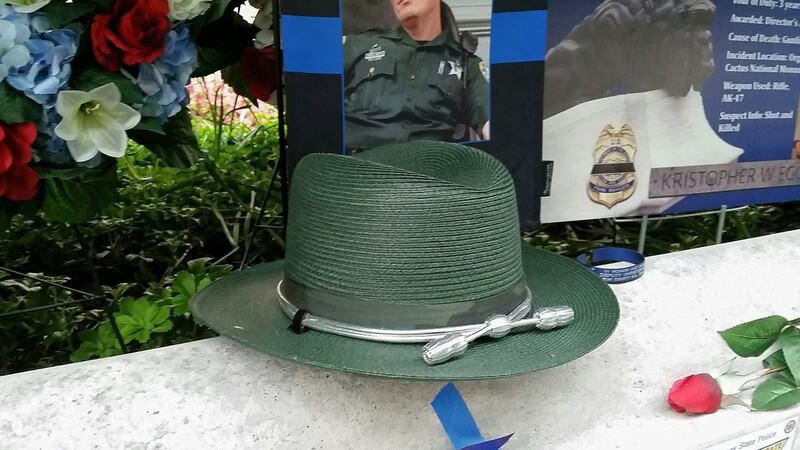 Beginning last year, one of the first things I look for at the memorial are tributes left in memory of Officer Ashley Guindon (see photo above), a local area officer who was ambushed and killed in 2016 on her very first day on the job. Her name was added to the wall last year. 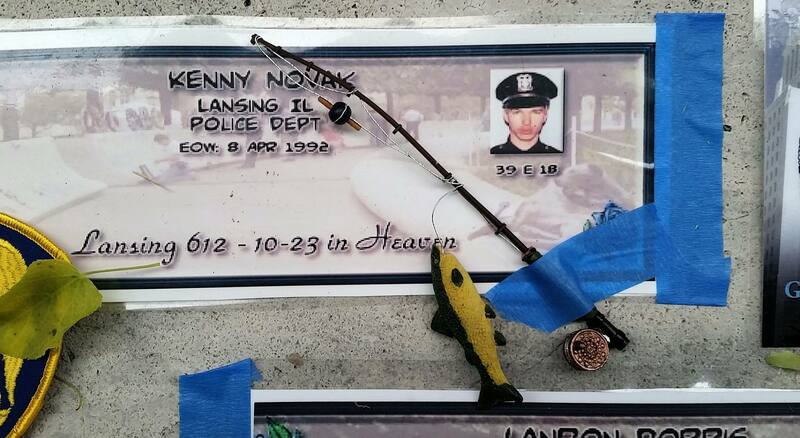 After that, as I look through the tributes, I try to imagine the stories behind them. When I see them some of the tributes such as official photos and news articles give me a glimpse into the personality of the hero lost. And when I see small footprints or handprints made with paint, or family photos taken during happier times, I think about the children who are growing up without a parent. 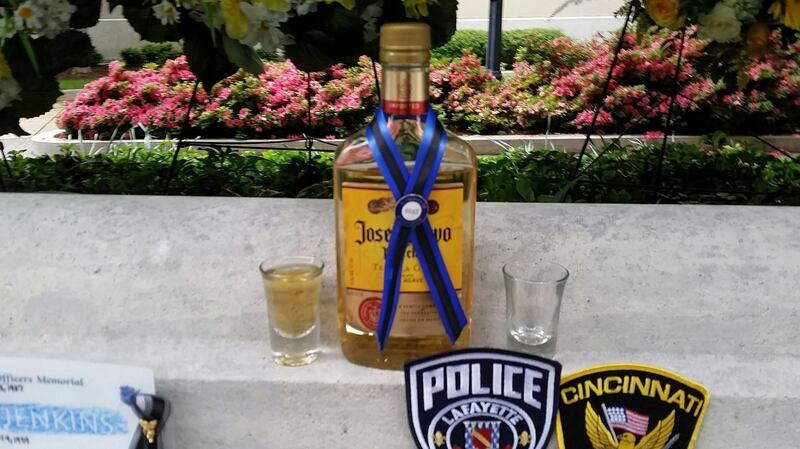 When I see beer or a couple of shot glasses, I think about the partners and coworkers who used to go out for a drink after their shift or maybe on the weekend, but are now learning to live with the pain of their loss. 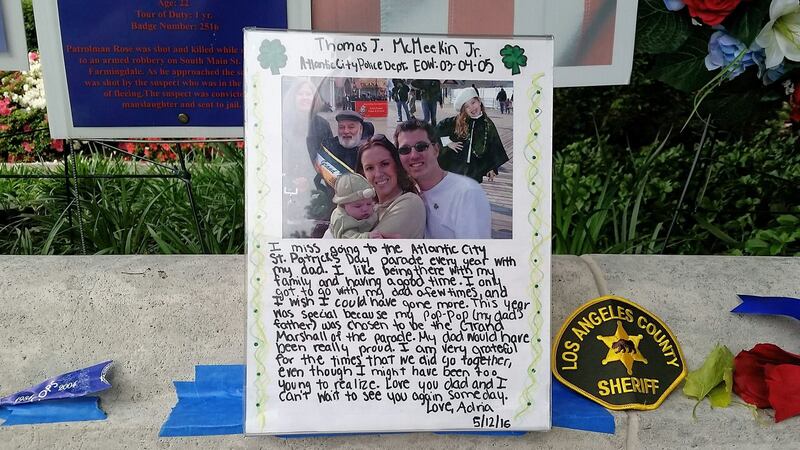 When I see hearts or flowers or other personal mementos, I think of the spouses or other family members who will never see their loved ones again during this lifetime. 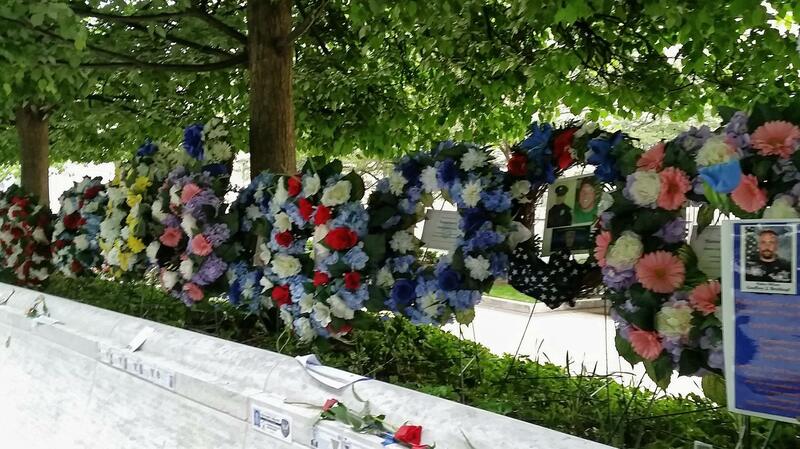 And when I see tributes to officers who were killed years or even decades ago it shows me that the passage of time does not diminish the losses suffered. 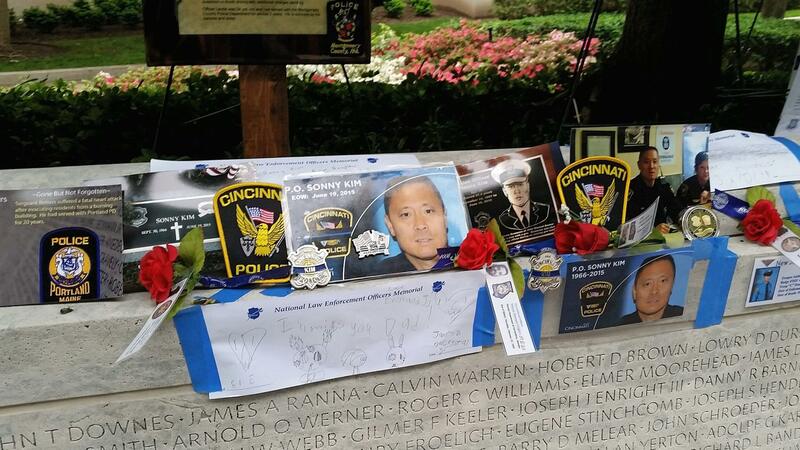 The tributes left behind at the National Law Enforcement Officers Memorial change every year, sadly, much like the memorial itself, to which names are added every year. But the names are more than just inscriptions in cold marble. They are the names of men and women who were heroes. But they were not just heroes for the way they died. They were heroes for the way they lived. 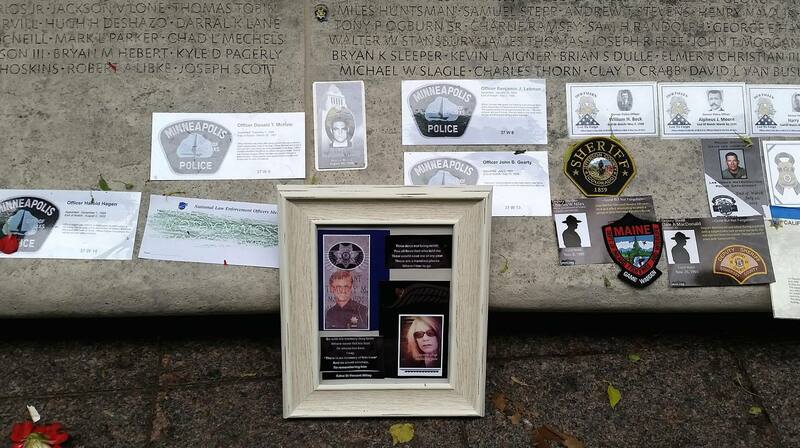 And the tributes left at the memorial help convey that to those of us for who they died to serve and protect. 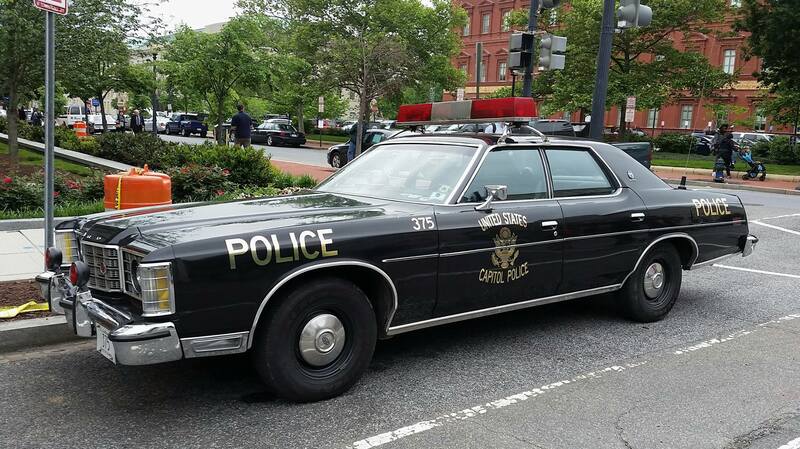 As the week designated for recognizing and honoring our nations law enforcement officers is coming to an end, I thought I’d share these photos of some of the many different law enforcement vehicles I have happened upon on the streets of D.C. I don’t know how many of them may still be in official use. Or whether they are for just ceremonies and special occasions. 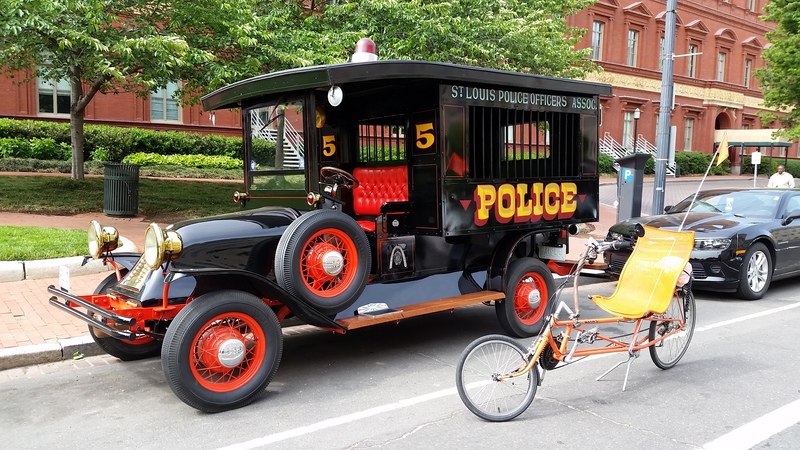 But I found them all interesting, and yet another reason to visit the city on Peace Officers Memorial Day (which this year is tomorrow), and throughout National Police Week. 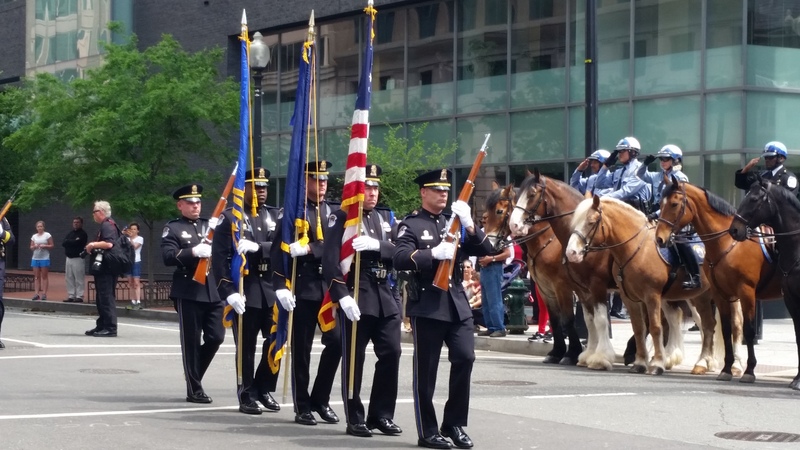 Designated in 1962 by President John F. Kennedy to be observed annually on May 15th, this Sunday is Peace Officers Memorial Day. 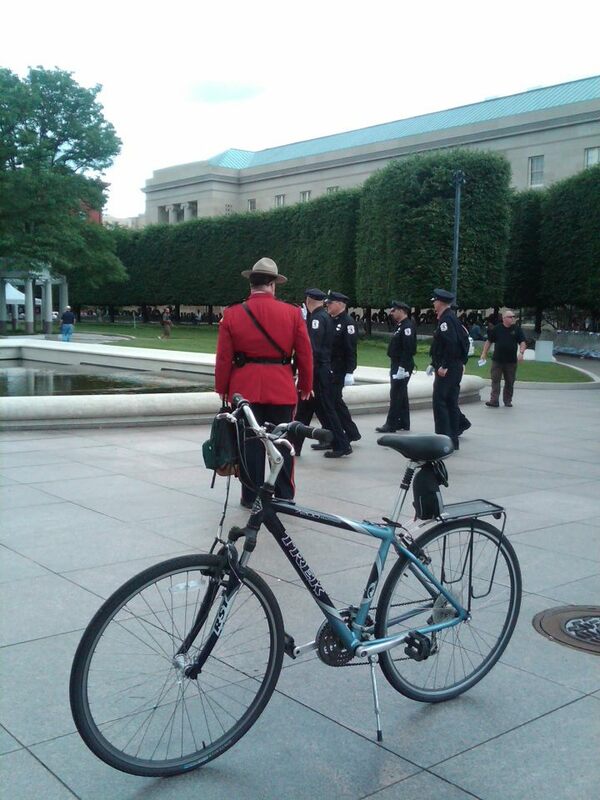 The Presidential proclamation also designates the week during which that date falls each year as National Police Week. 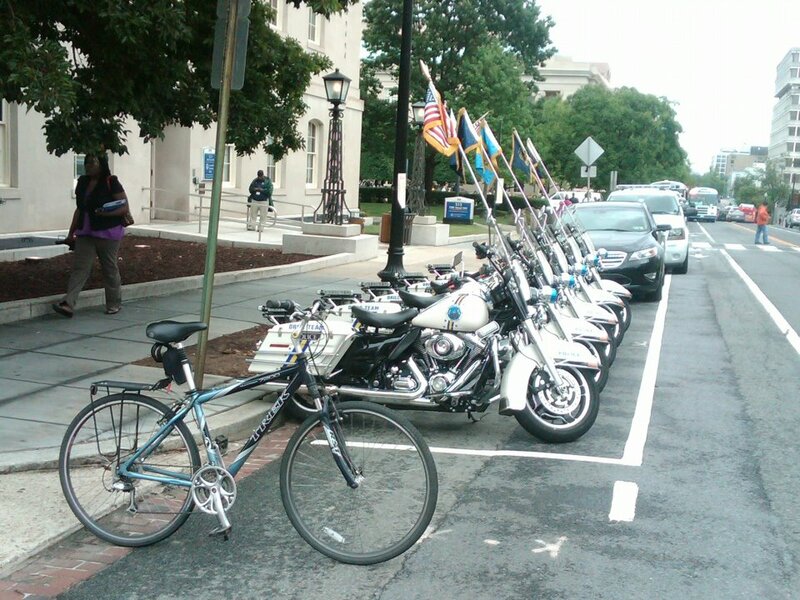 So this week is National Police Week. 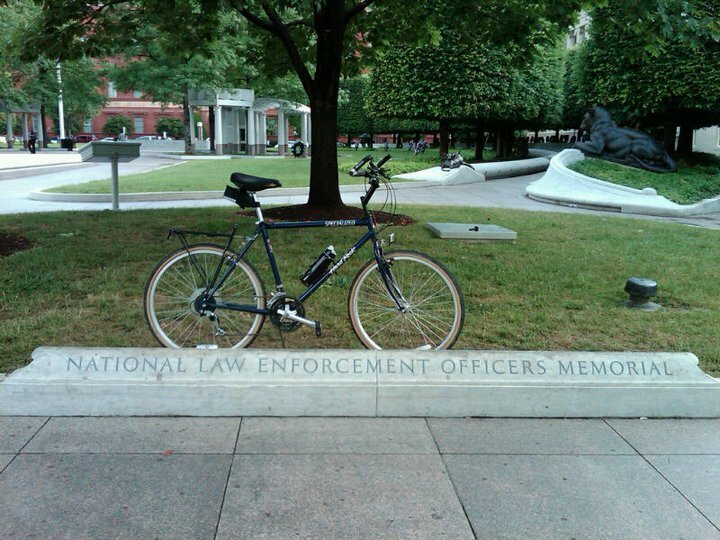 In observance of this, on today’s bike ride I visited the National Law Enforcement Officers Memorial. 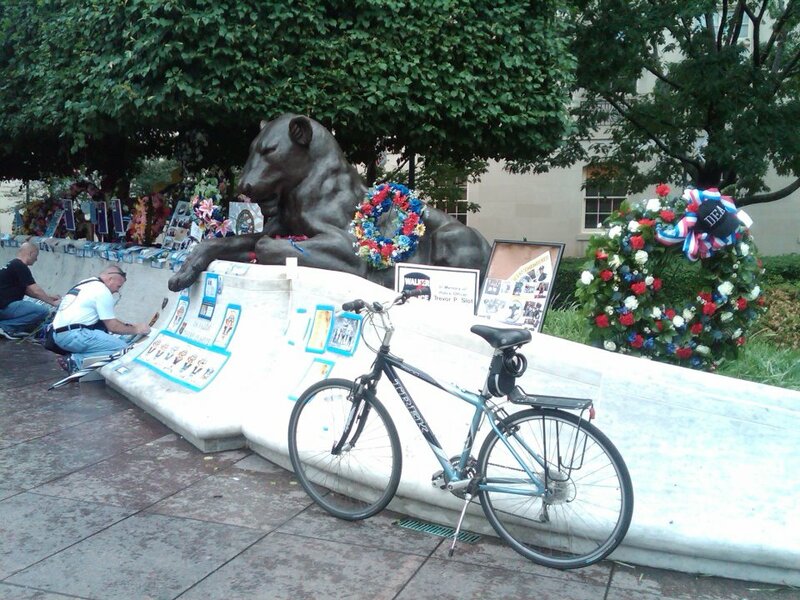 The Memorial, which is dedicated to all law enforcement officers who have died in the line of duty, is located at on E Street, between 4th and 5th Streets (MAP), in northwest D.C.’s Judiciary Square neighborhood. 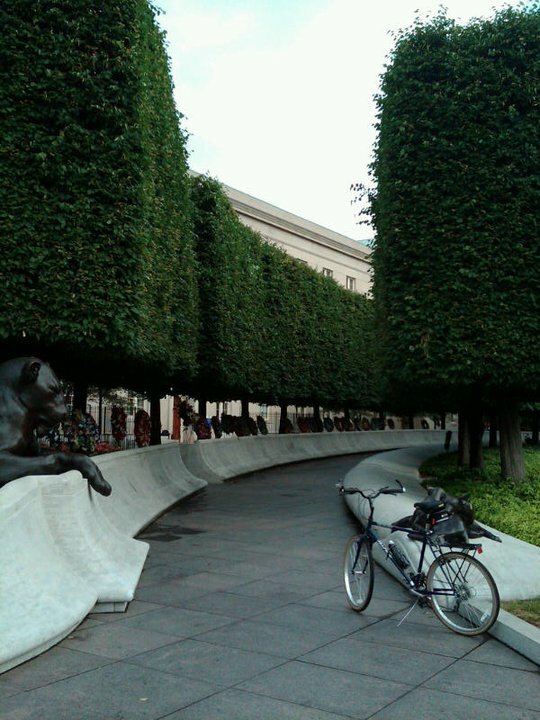 At the time it was dedicated, the names of over 12,000 fallen officers were engraved on the National Law Enforcement Officers Memorial’s walls. 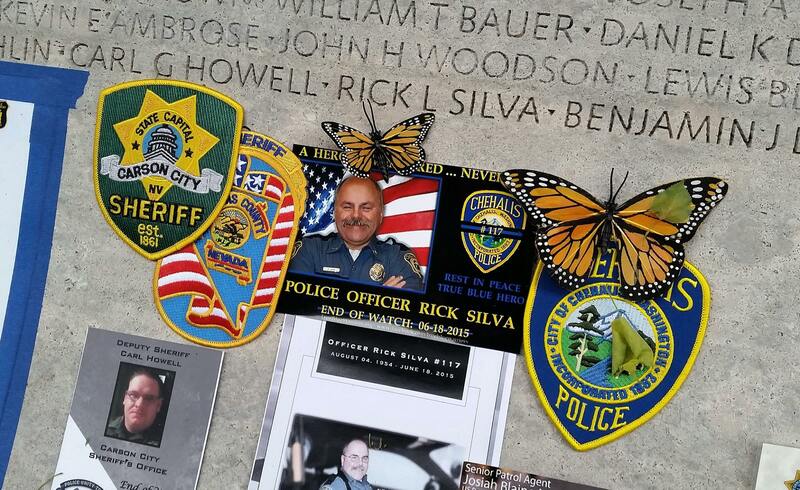 Currently, there are 20,789 names engraved on the walls of the Memorial, which in addition to local law enforcement officers also includes 1,102 Federal officers, as well as 668 correctional officers and 36 military law enforcement officers. These numbers include 292 female officers. 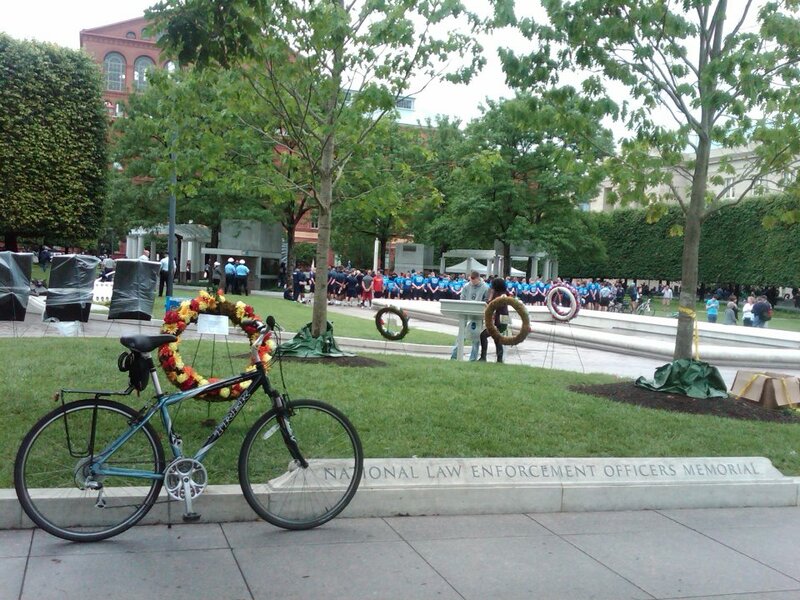 Unfortunately, unlike most other memorials, the National Law Enforcement Officers Memorial continues to change from year to year. 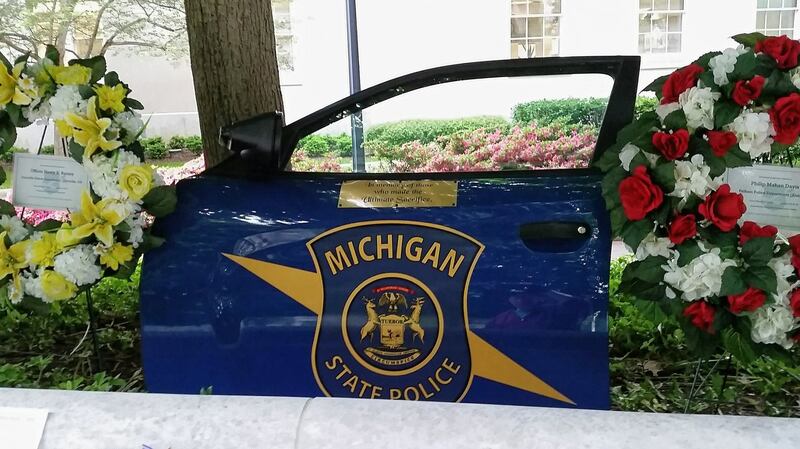 That is because the new names of fallen officers are added to the monument each spring, in conjunction with National Police Week. 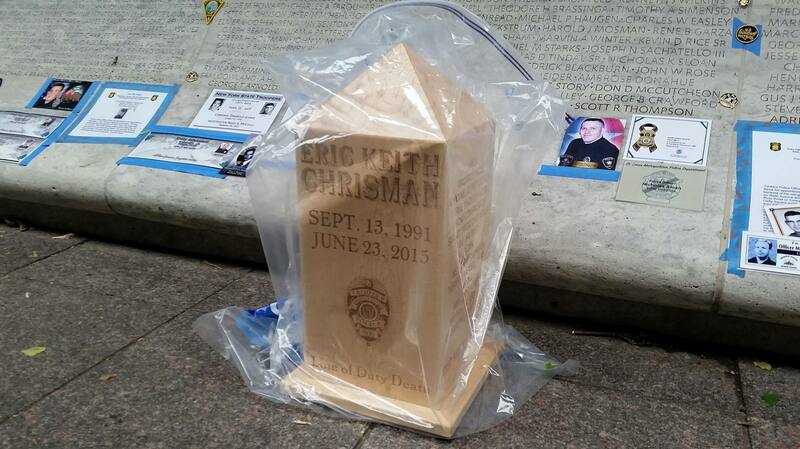 This year, there will be 117 more names being added to honor the officers who died in the line of duty in 2015. 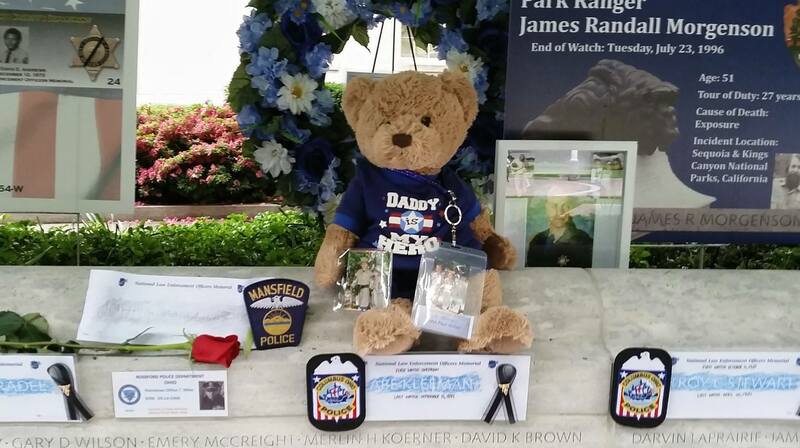 In an attempt to capture one of the most personal and human elements of the ever-changing Memorial, during my visit today I took photos of some of the poignant tributes and mementos left behind at the memorial during this year’s National Police Week. 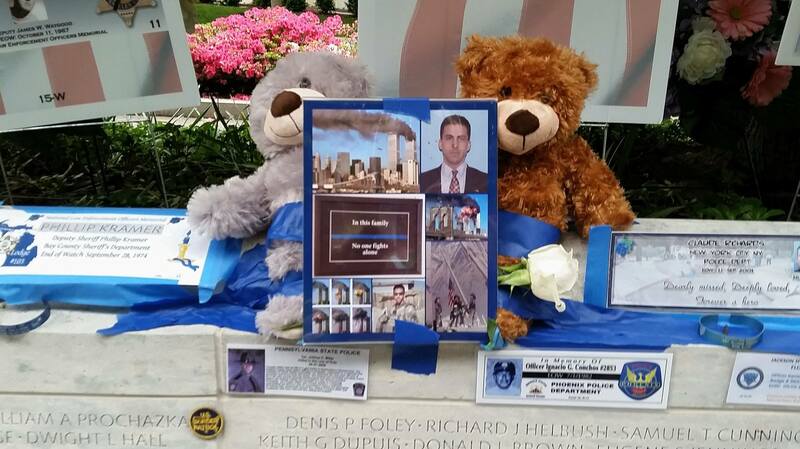 Placed at the Memorial by the family, colleagues, friends, and other loved ones of the heroes being honored, the various tributes add a personal touch and an added beauty to the Memorial. 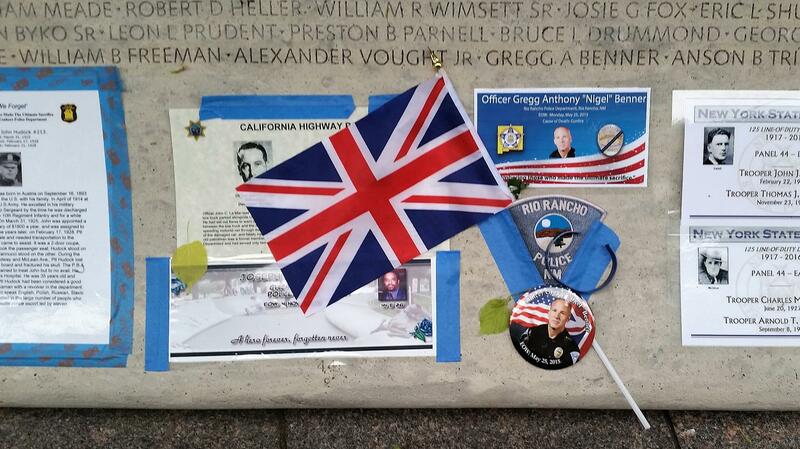 They also help us to remember and reflect on the fact that the names are more than an inscription on a wall. Each name represents someone who knowingly and willingly risked his or her life, and paid the ultimate sacrifice, to protect each of us. 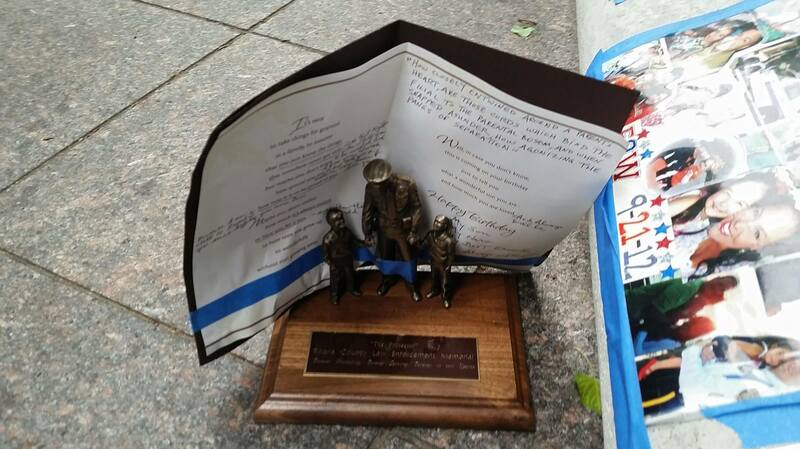 The mementos also give us a glimpse of the pain and the sacrifice of those they left behind. 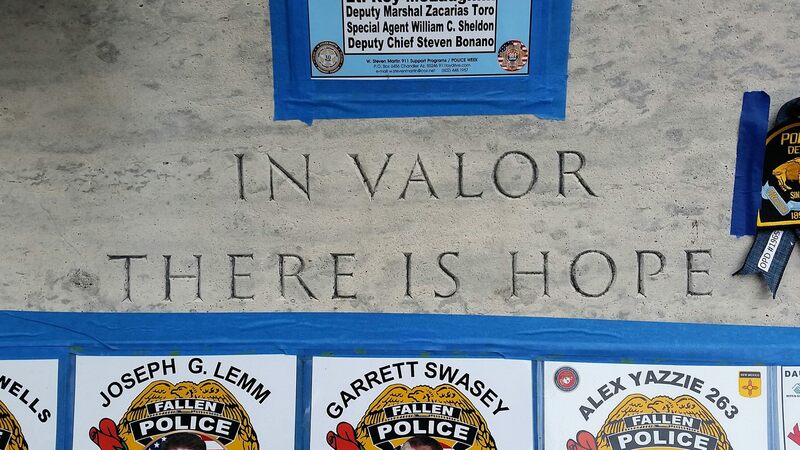 This also holds true for the 36 law enforcement officers who have died in the line of duty already this year. Be sure to click on the thumbnails for the full-size photos, so that you can view the details and personalized nature of the tributes. 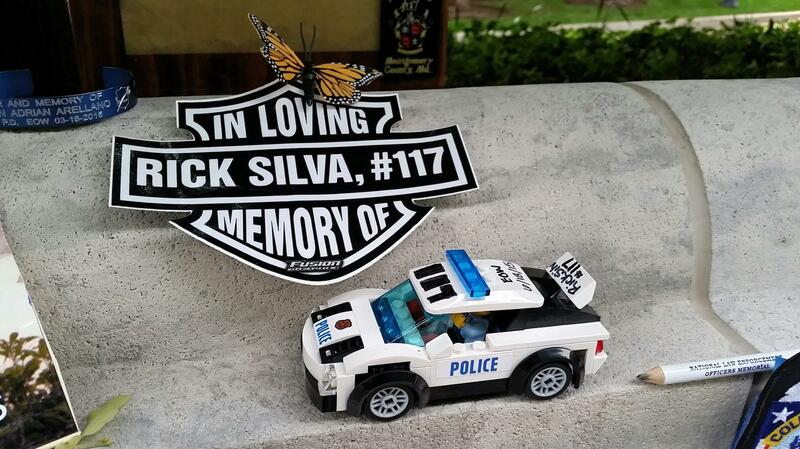 In addition to the patches, badges, photos and flowers left behind, there are also a number of other personal mementos that may really make you think. 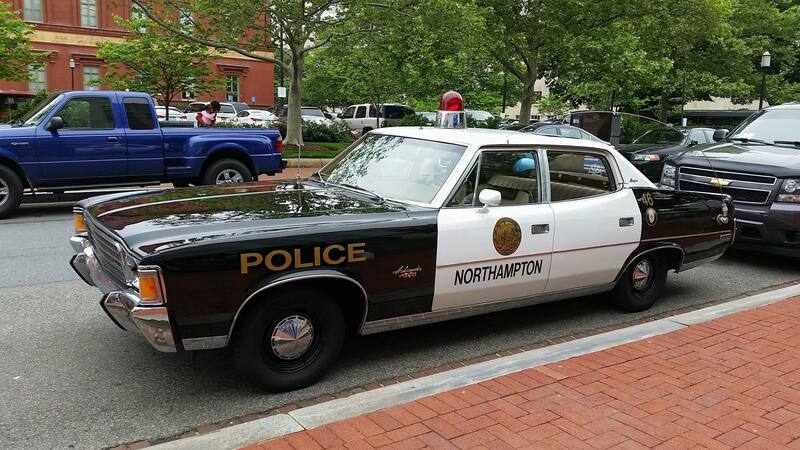 Then after you have browsed through the photos, I encourage you to watch the following short video, narrated by legendary news commentator, author and columnist Paul Harvey, to find out just who policemen and law enforcement officers really are. And by the way, Paul Harvey’s father, Harry Aurandt, was a police officer in Tulsa, Oklahoma. He was killed when Paul Harvey was only three years old. 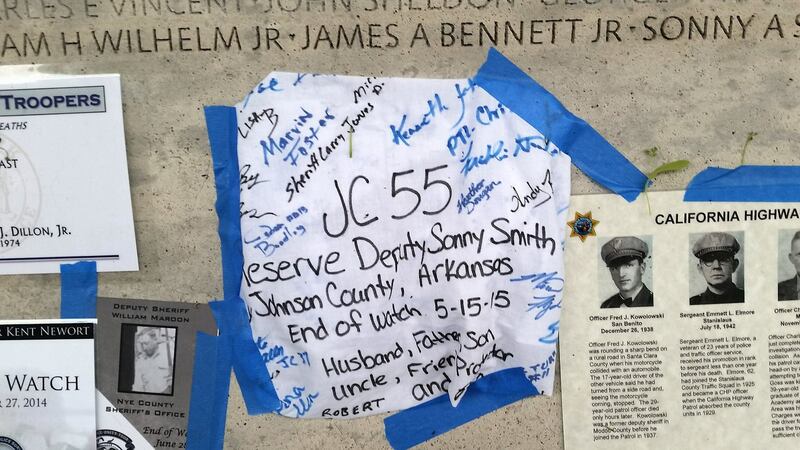 And his name is inscribed on the wall of the National Law Enforcement Officers Memorial. 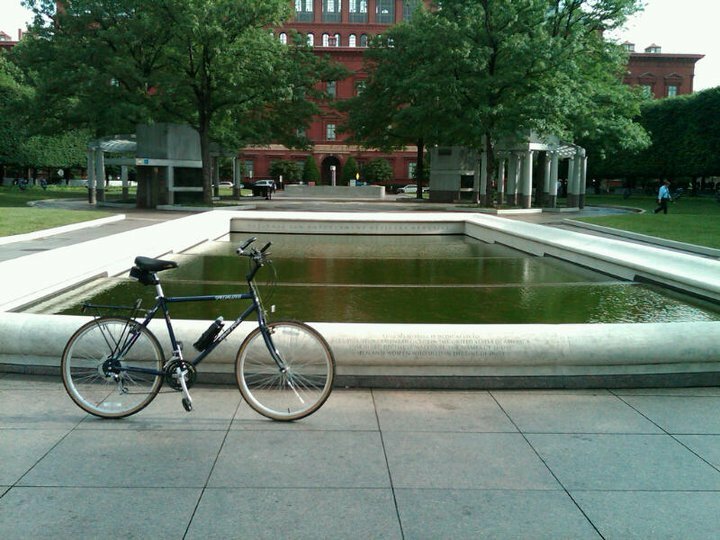 On this bike ride I rode to St. Patrick’s Catholic Church, which is located at 619 10th Street (MAP) in northwest D.C.’s Penn Quarter neighborhood. 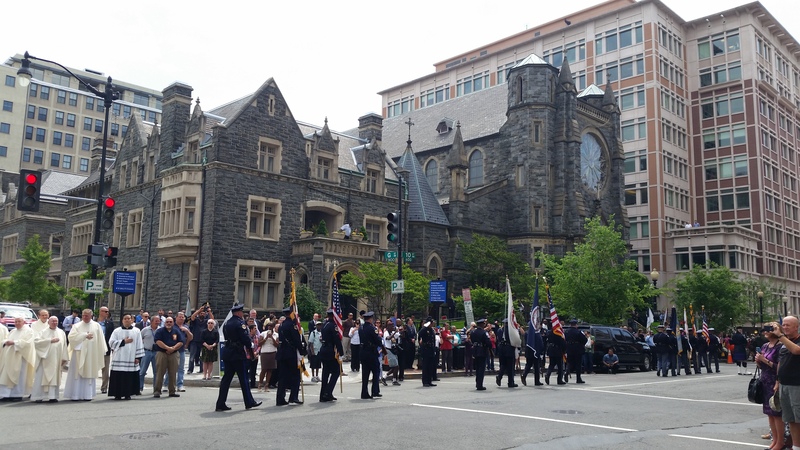 The oldest parish in the national capitol city, St. Patrick’s Church was founded in 1794 to minister to the needs of the stonemasons building The White House and The U.S. Capitol Building. 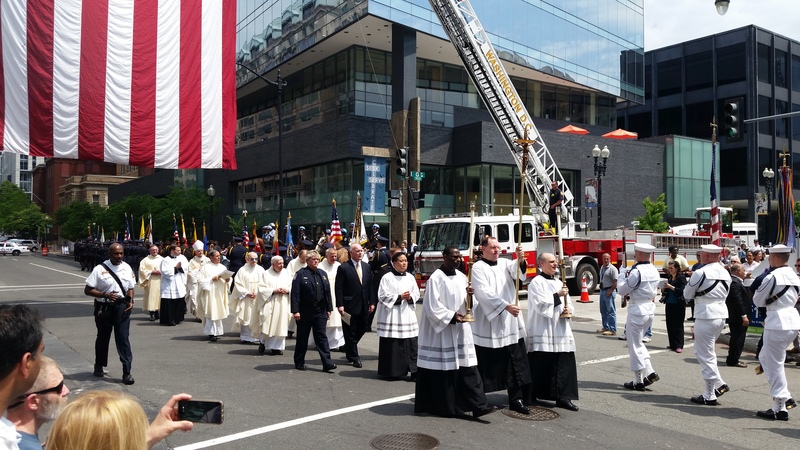 The parish continues to serve the needs of downtown D.C. through daily Mass and confession, as well as adult education and cultural activities. 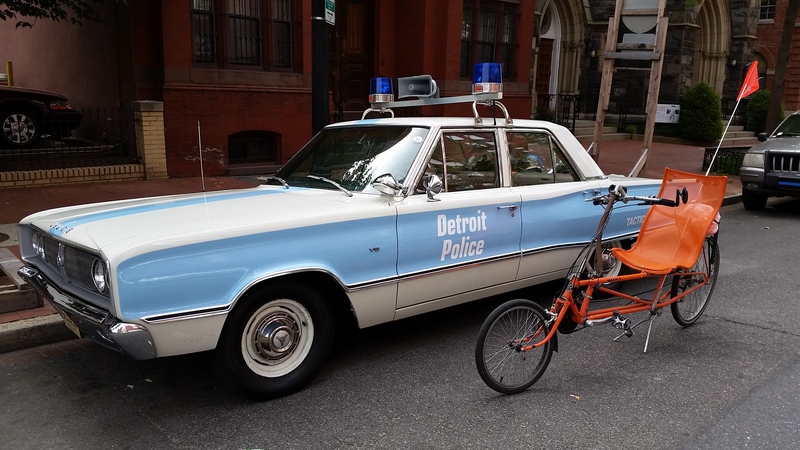 It was for one of these activities, the Annual Blue Mass, that I chose today to ride to St. Patrick’s Church. 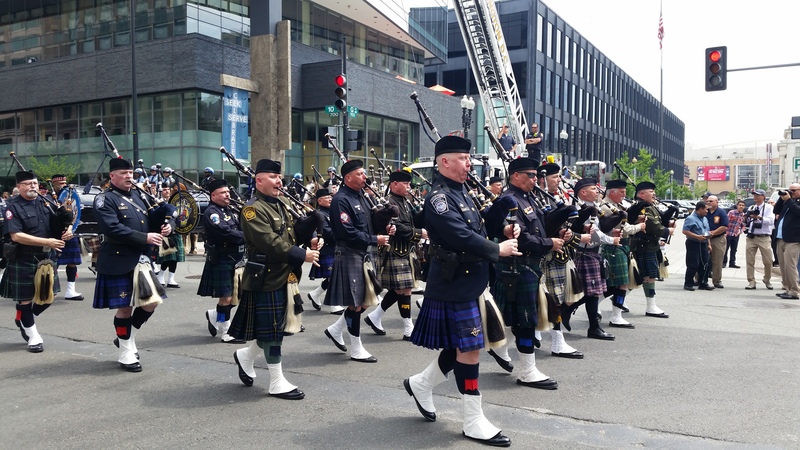 In 1962, President John F. Kennedy signed a proclamation which designated May 15th as Peace Officers Memorial Day, and the week in which that date falls as National Police Week. 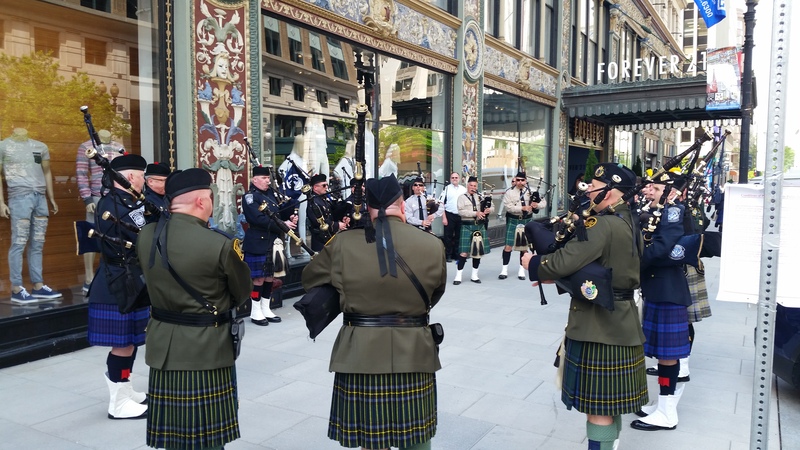 And each year prior to the beginning of National Police Week, St. Patrick’s Church holds The Blue Mass to pray for those in law enforcement and fire safety, to remember those who have fallen, and to show support for those who continue to serve. 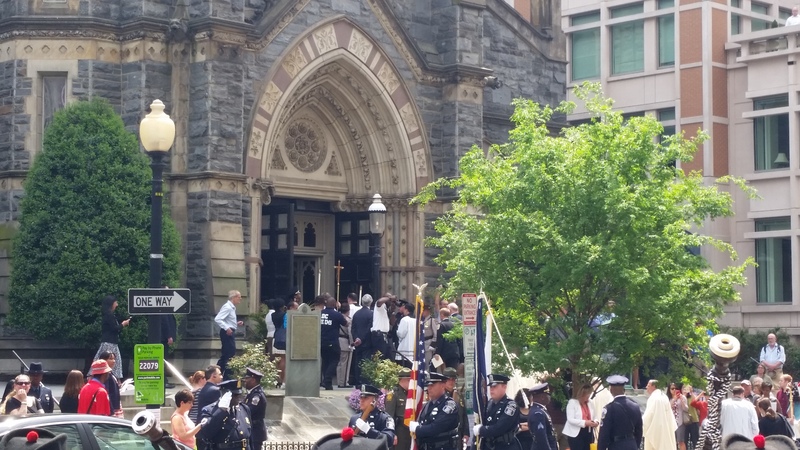 Before the beginning of the Mass, hundreds of law enforcement officers and public safety officials gather outside for the solemn processional into the church. 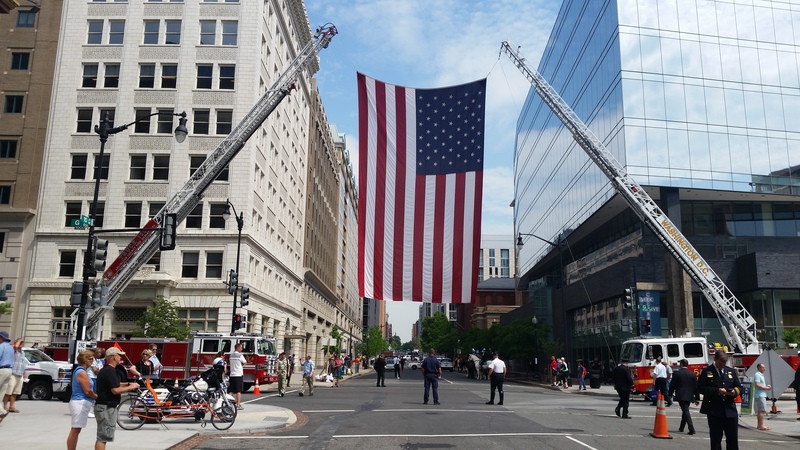 Units from a variety of Federal, state, and local jurisidictions from the D.C. Metropolitan Area and around the country gather in official formation to pass under a huge American flag proudly hung over the street by two fire ladder trucks. Also gathered outside are officers on horseback, as well as pipe and drum corps units. 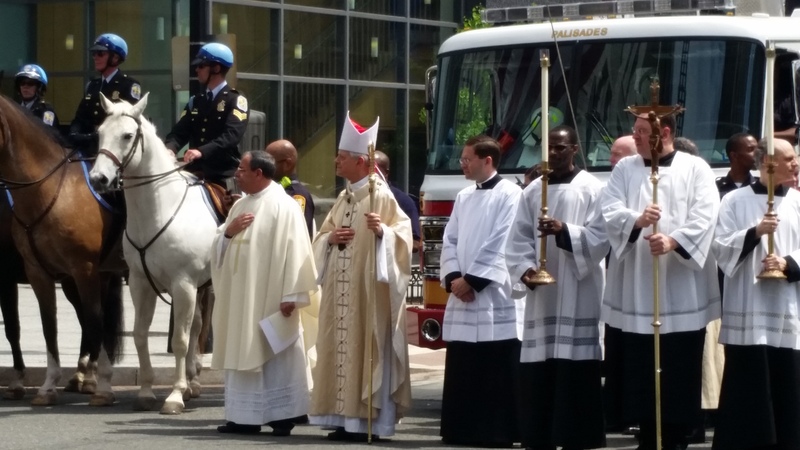 Inside the church, the principal celebrant and homilist for this year’s Mass was His Eminence Donald Cardinal Wuerl, Archbishop of Washington. 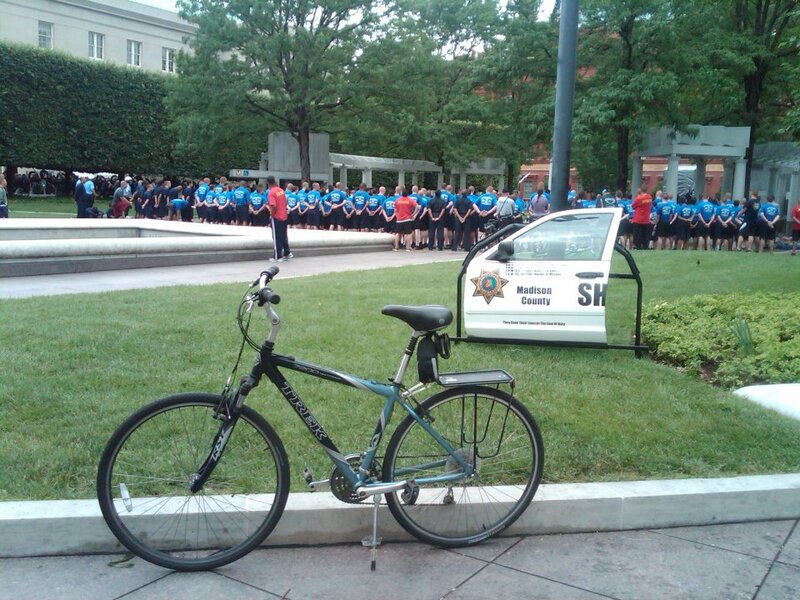 The Blue Mass included Police Officers’ Prayer to Saint Michael, who as the Archangel of battle and defender of Heaven, is said to be the Patron Saint of policemen, and the Firefighters’ Prayer to Saint Florian, the patron saint of firefighters, as well as chimney sweeps, soapmakers, and the city of Linz, Austria. 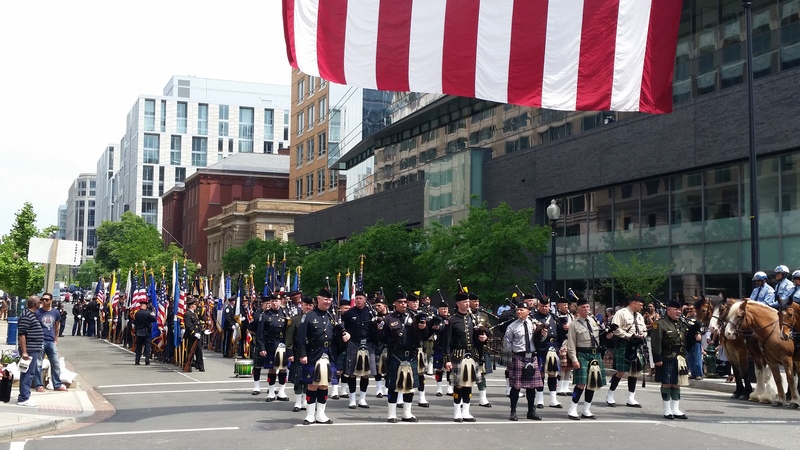 The Mass also included an honor guard, bagpipers, and the solemn playing of “Taps” in memory of those who made the ultimate sacrifice during the past year. Being a police officer or first responder is not only an extremely difficult and dangerous job, but also involves a willingness to sacrifice for others, even if they don’t appreciate it. 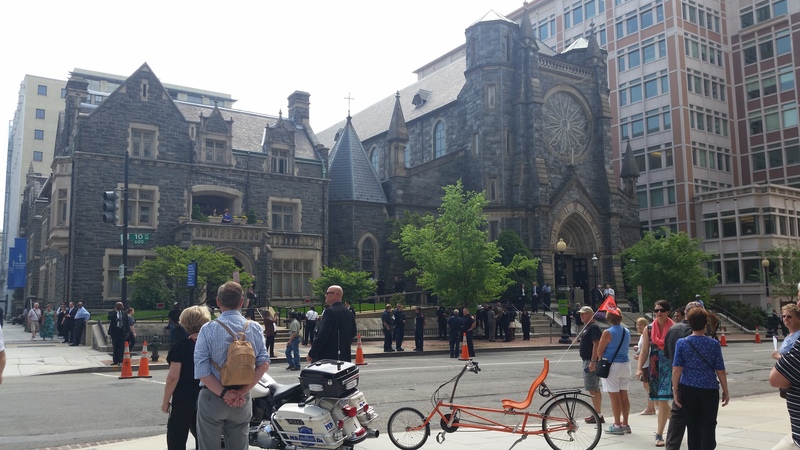 Today’s Blue Mass was a powerful reminder of that. Dear Saint Michael, Your name means, “Who is Like a God”, and it indicates that You remained faithful when others rebelled against God. 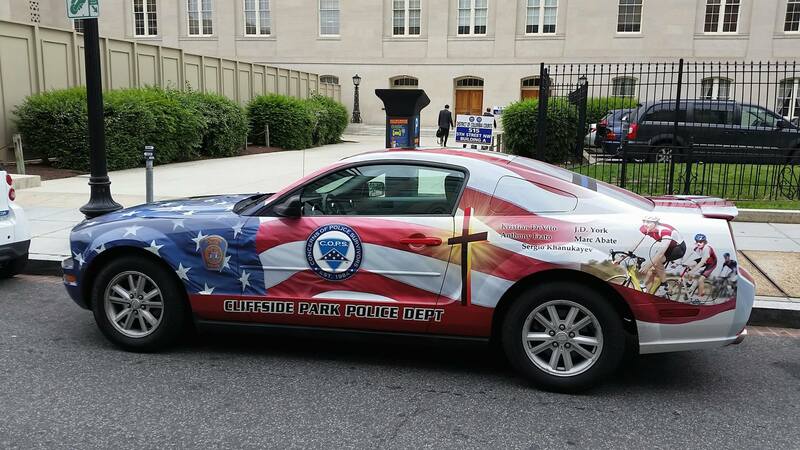 Help the police officers of our day who strive to stem the rebellion and evil that are rampant on all sides. Keep them faithful to their God as well as to their country and their fellow human beings. Amen. Dear God, through the intercession of our patron, Saint Florian, have mercy on the souls of our comrades who have made the supreme sacrifice in the performance of their duty, and on all who have gone before us after years of faithful discharge of their responsibilities which now rest on ourselves. Give us Grace to prepare each day for our own summons to Your tribunal of justice. Into Your hands O Lord, I commend my spirit. Whenever You call me, I am ready to go. Merciful Father of all men and women, save me from all bodily harm, if it be Your will, but above all, help me to be loyal and true, respectful and honorable, obedient and valiant. Thus fortified by virtue, I shall have no fear, for I shall then belong to You and shall never be separated from You. Amen. 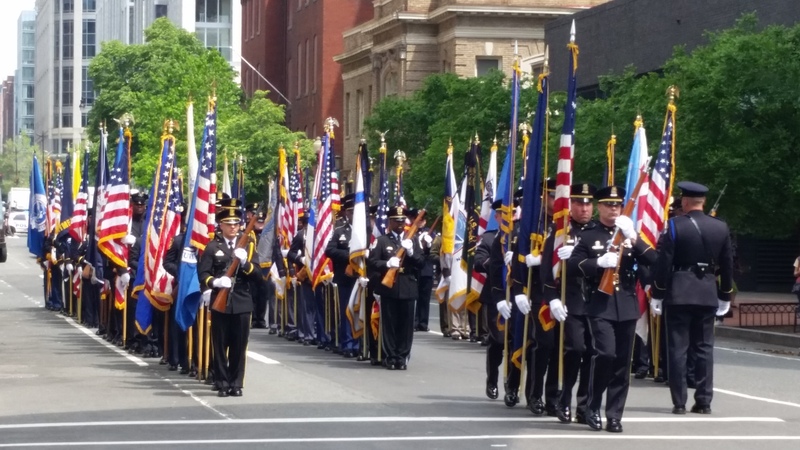 In 1962, President John F. Kennedy signed a proclamation which designated May 15th as Peace Officers Memorial Day, and the week in which that date falls as National Police Week. 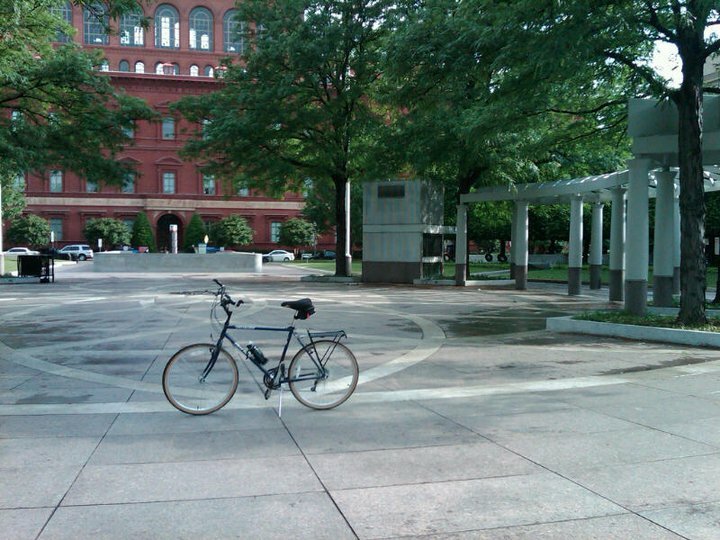 So to commemorate today’s beginning of this year’s National Police Week, I am highlighting the events taking place, many of which will take place at The National Law Enforcement Officers Memorial, located on E Street, between 4th and 5th Streets, in northwest D.C. (MAP). 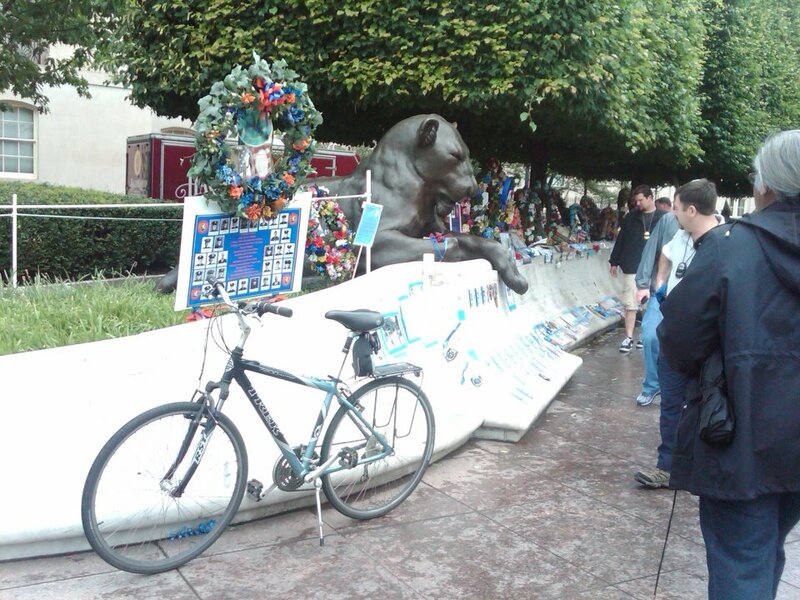 The Memorial is the nation’s monument to law enforcement officers who have died in the line of duty. 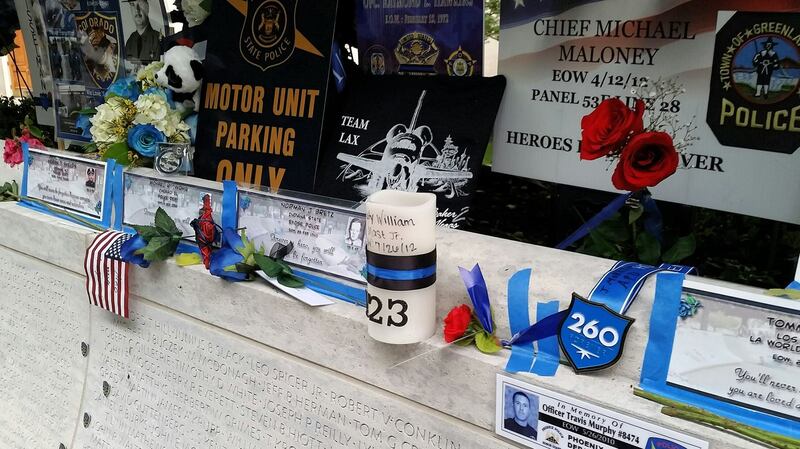 Unfortunately, unlike many other memorials in D.C., the National Law Enforcement Officers Memorial is always changing, with new names of fallen officers added to the monument each spring, in conjunction with National Police Week. 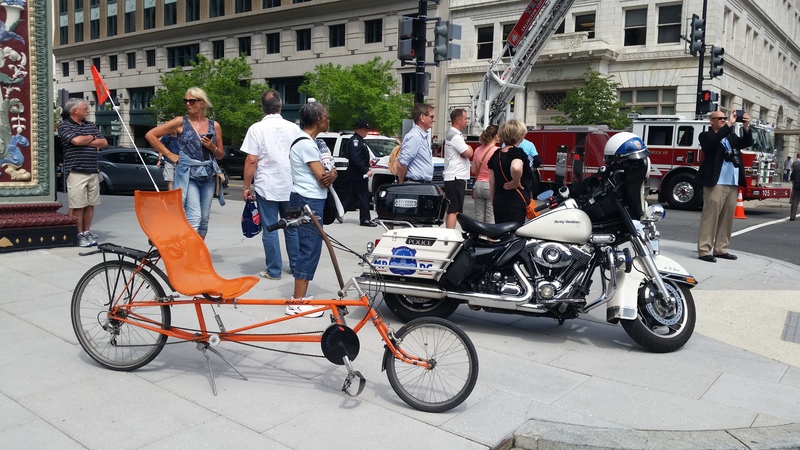 Activities and events scheduled for this week are varied, from Thursday’s Fraternal Order of Police Wreath Laying Ceremony at the Memorial to the 33rd Annual National Peace Officers’ Memorial Day Services, also on Thursday, on the front lawn of the U.S. Capitol Building. 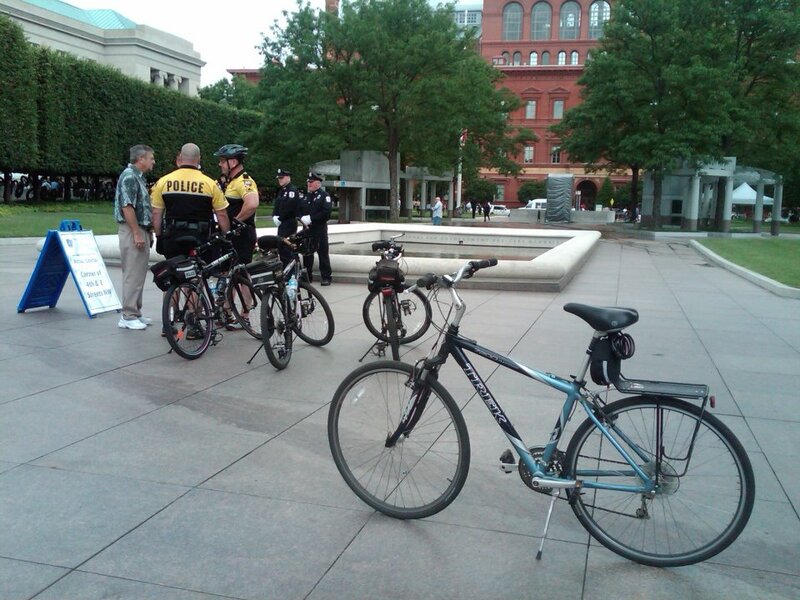 Some of the other activites will include: Wednesday’s 20th Annual Emerald Society and Pipeband March to and Service at the Memorial; the National Police Survivors’ Conference on Wednesday in nearby Alexandria, Virginia, and; The National Law Enforcement Prayer Breakfast and Blessing of the Badge, to take place at the Ronald Reagan Building on Thursday. One of the highlights of the week will be the 26th Annual Candlelight Vigil, which will take place on Thursday at the Memorial. 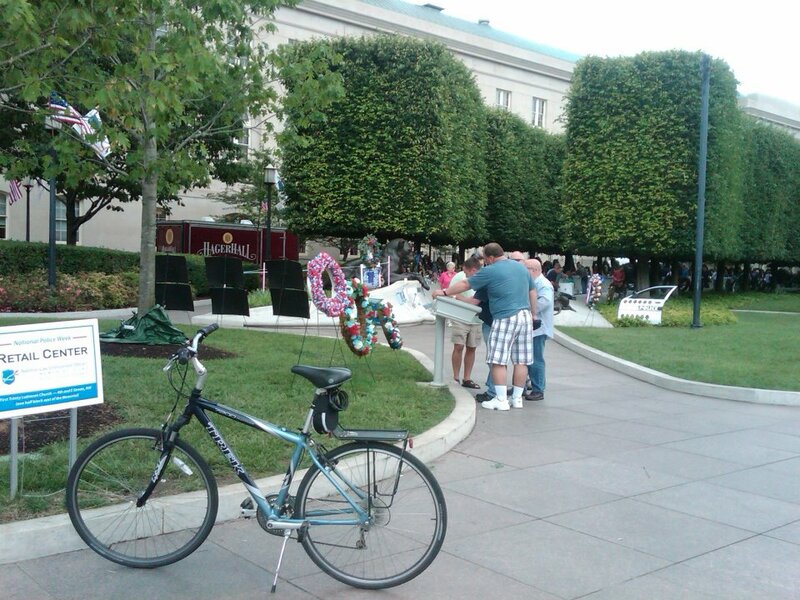 A reading of the names newly engraved on the Memorial will immediately follow the vigil. 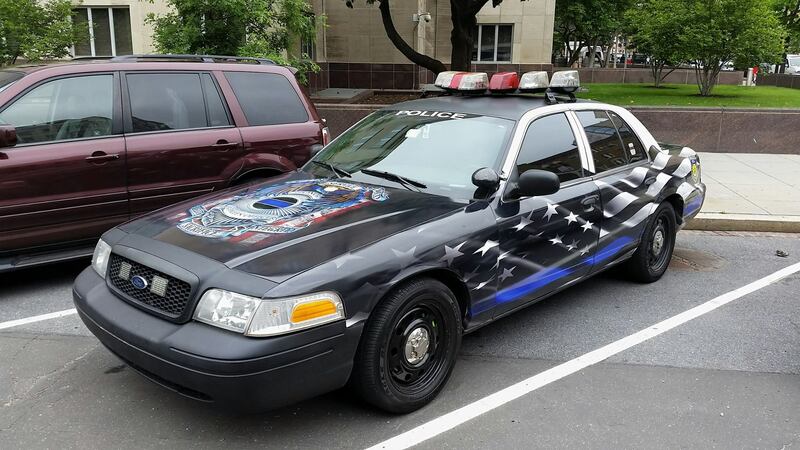 On average, one law enforcement officer is killed in the line of duty somewhere in the U.S. every 58 hours. 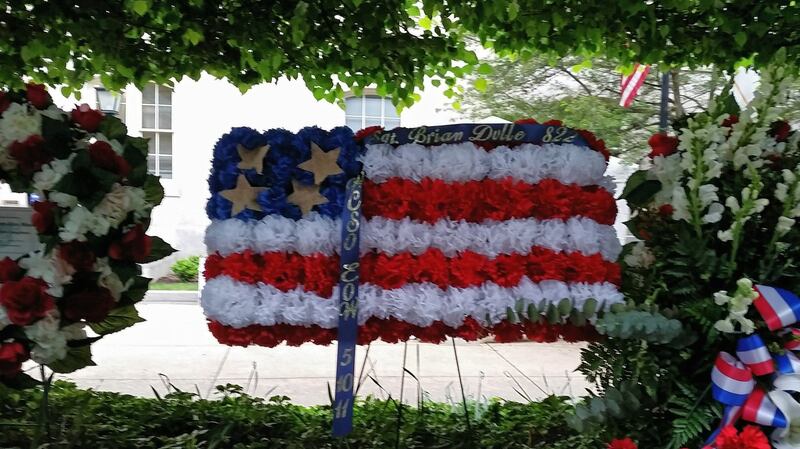 Since the first known line-of-duty death in 1791, more than 19,000 U.S. law enforcement officers have made the ultimate sacrifice. 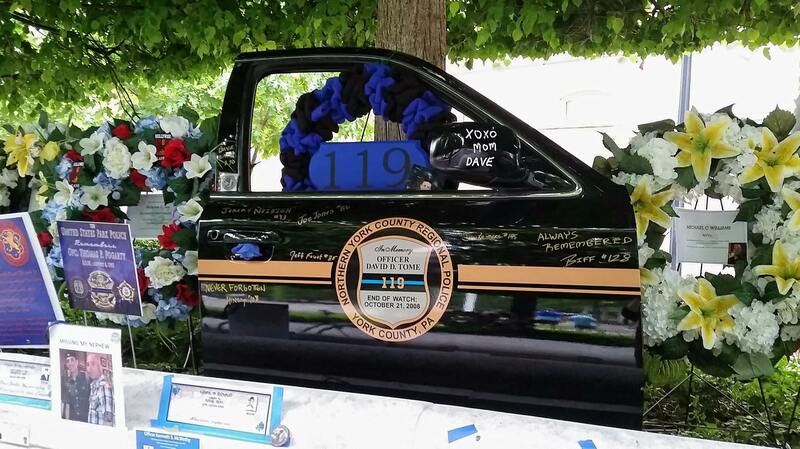 Last year, 101 men and 4 women serving in law enforcement died in the line of duty across the country. 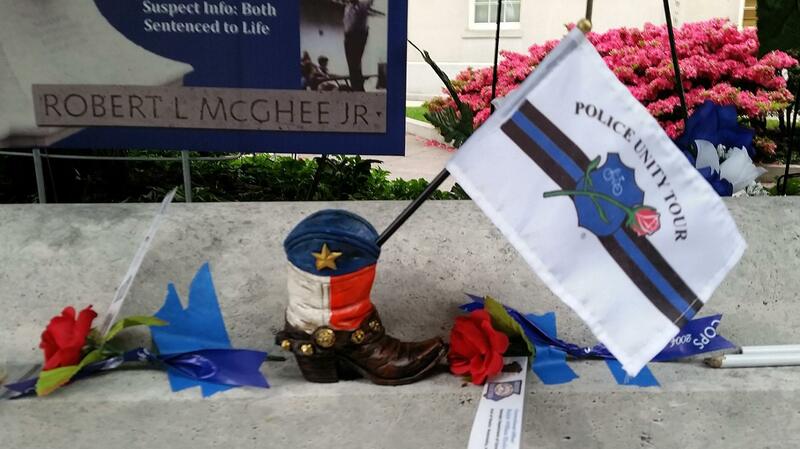 In 2013, more officers were killed in Texas (13) than any other state; followed by California (10); Mississippi and New York (7); and Arkansas (6). 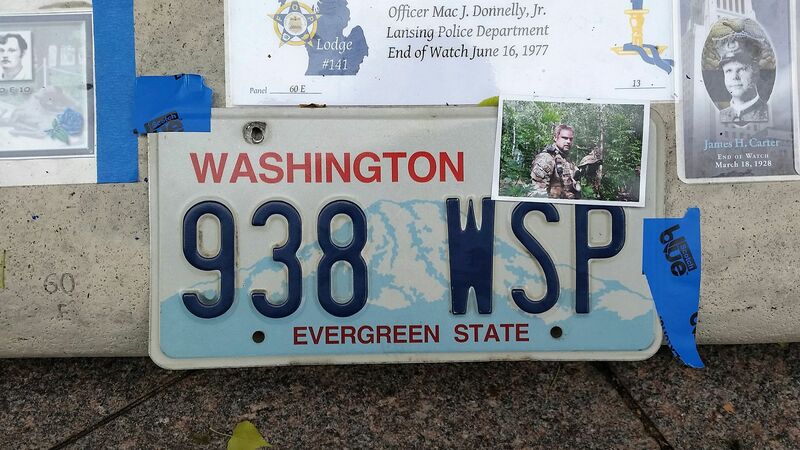 Nine officers killed in 2013 served with Federal law enforcement agencies. 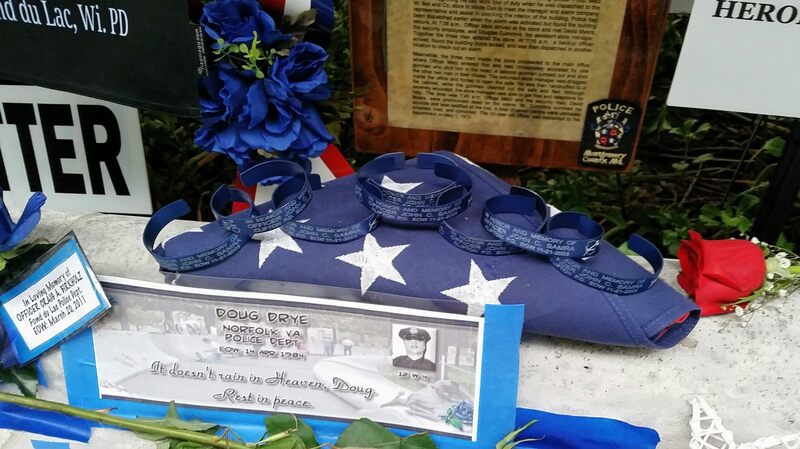 On average, the officers who died in 2013 were 42 years old and had served for 13 years. 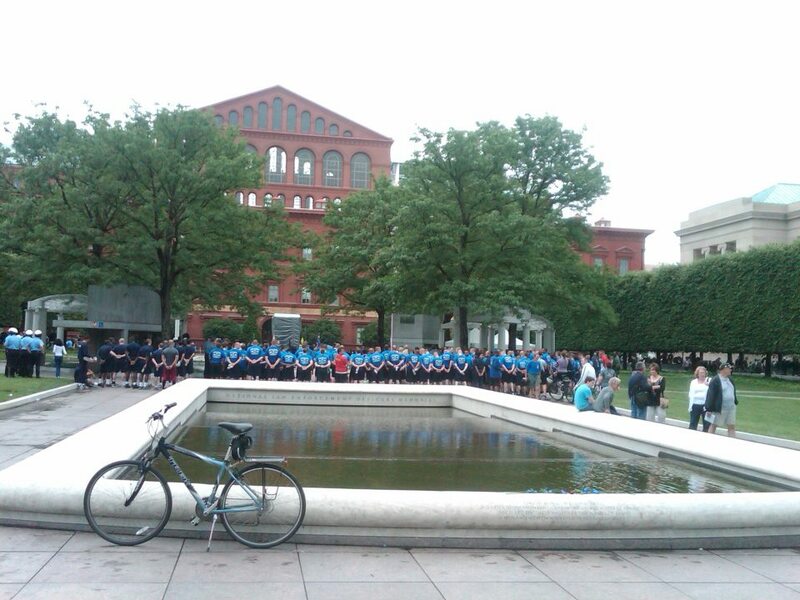 A complete copy of the preliminary report on 2013 law enforcement fatalities is available at: http://www.nleomf.org/facts/research-bulletins/. The good news is that law enforcement officer fatalities dropped for the second year in a row to the lowest level since 1959, and the number of officers killed in firearms-related incidents this year was the fewest since the 1800’s. 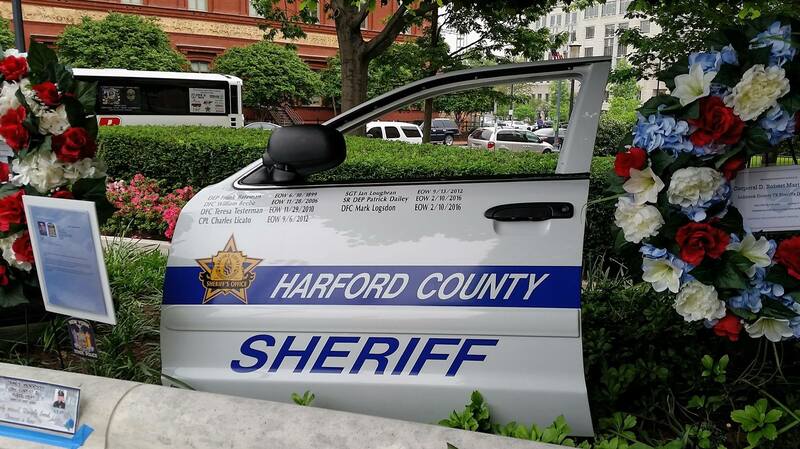 The significant drop in law enforcement fatalities during the past two years serves as encouragement that the intensified effort to promote law enforcement safety is making a difference. 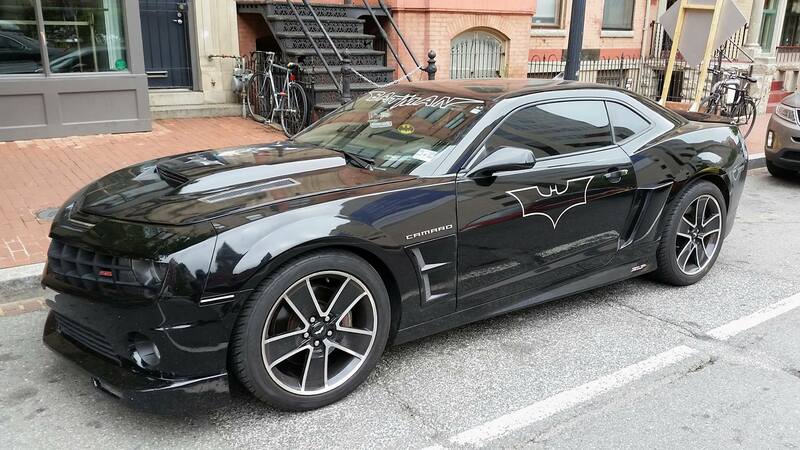 But the only acceptable number would be zero deaths, and there have already been 34 officers killed in 2014.